Let’s Start at the Very Beginning (A Very Good Place to Start). Welcome to The Yoga Loft’s Official Blog! I am your host, Megan Ridge Morris, the Writing Yogini. Be sure to stop by our blog every week to read up on all things yoga. Getting through the eight limbs will take time, so look forward to future blog posts that will thoroughly cover each limb. I want to start with Ahimsa, at the very beginning, because the most basic thing to know about non-harming is that it can be applied to all of the other yamas as well as the other seven limbs (and essentially to everything that we do). 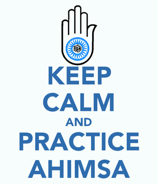 One of my favorite ways to approach ahimsa is to focus on simply *being* instead of doing. Because if I’m not doing anything I’m not harming anything. And that’s an excellent place to start. However, we live in a culture where “being” isn’t cool. Instead, we are rewarded for working efficiently, for our accomplishments and productivity. And sometimes in the process of getting a lot of stuff done, we can easily lose sight of who or what we may be harming. For myself, I know that when I am packing my schedule full of things to do, that eventually causes stress in my life. I reach a point where I feel as if there’s not enough generic xenical 60mg time for anything – I can’t truly focus on my work or my family, and most importantly, I have absolutely no time to take care of myself. And when I’m not taking care of myself, isn’t that the same as harming myself? I become irritable, impatient, resentful and my mood affects the way that I treat the people around me. In the end, once I inevitably burn out (usually I get sick and am then forced to slow down), the dust settles and I realize that packing my schedule only leads to harmful outcomes. In some rare circumstances, the risk of causing harm outweighs the benefit of not causing harm, and that’s what makes this constant, mindful consideration so important. Perhaps causing harm now will lead to less harm in the future— for example, organizing an intervention for a loved one suffering from addiction. The initial conversation will likely be very painful for everyone involved, but the hope is that the addict accepts help and the result is healing for those affected by the addiction. Keeping ahimsa in mind isn’t always easy work, but with time and consistent practice, you may find that you are honoring all of your relationships to the fullest— Your relationship to the environment, to others and to yourself, if you make the conscious choice again and again to ask yourself, “Could this cause harm?” Then, you can walk away from every situation knowing that you showed up in word and deed exactly as you intended— with awareness, love and kindness. If we commit to doing this work on ourselves first, perhaps living our yoga will inspire others to do the same, and collectively we will see a decrease in global harm and violence. The work must start from within if we expect to see change in others. Feel free to comment below about your experiences with ahimsa. We’d love to hear from you! Megan, I’m so excited that you are back to writing. I love reading your work. These 2 are really great posts – I look forward to more! Xo.